A skull fragment thought to come from Adolf Hitler is in fact that of an unidentified woman, according to a US study that has resurrected questions about the Nazi leader's death. 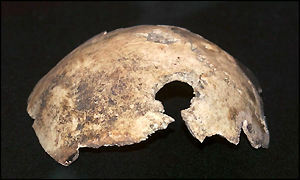 The bone, bearing a bullet hole, has been held up to support the theory that Hitler shot himself and took cyanide in his Berlin bunker as Soviet troops approached in April 1945. Doubts about the chain of events -- and even speculation that Hitler got away -- have persisted for decades.